Children in Oaxaca Mexico. She always brings words of encouragement for each of the staff members, individually and corporately. She gave a wonderful devotion which she called Aim High and Stay low. It was a great balance for the life of a Christian. Especially for Christians living in community. The “aim high” part came from the words of Jesus where he told his followers that when He departed from the earth, that they would not only do the things He did, but even greater things. With the empowerment of the same Holy Spirit that empowered Christ, the disciples of Christ would do incredible things to grow the kingdom of God. But this only happens when Christians know what Christ did, and then aim high, to do the same things He did, and greater. she started a little home for needy children in Baja . Looking at her then she just seemed like an ordinary, everyday housewife. But, filled with the Holy Spirit, she began to Aim High. She prayed. 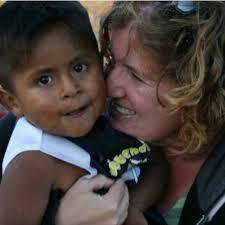 She took food and clothes to the poorest of the poor children in Mexico. She went to garbage dumps and brought children who were living off rotten scraps of cast off food, and brought them to a place where they ate three squares a day, received clothes to replace the filthy, soiled, rags that passed for their old clothes. With a humble heart filled with the same compassion Jesus had, she made a difference in this cold, dark world. She initially brought light and love to a handful of needy children. After almost half a century, her and the ministry of Foundation For His Ministry have touched and transformed thousand of poor Mexicans. That’s what I call Aiming High. It’s a profound message for all Christians, Aim High and Stay Low. With the power of the Holy Spirit and examples like that of Charla Pereau, we can all cooperate with God in spreading the good news that God loves us and wants us to be happy, and make this world a better place.